catholicbeer: Because 3-tiers are better than crap! Because 3-tiers are better than crap! I had some birthday money and an idea in my head and "WHAMMO! "- three-tier brewing system. 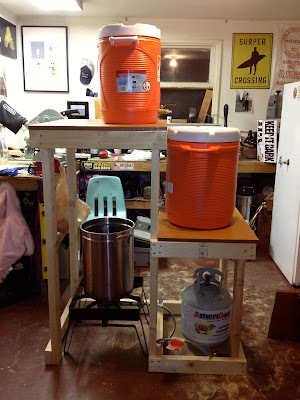 Previously, I was using a rectangular cooler and pouring the wort into hop bag to strain out the grains (shudder...). An awful technique that resulted in burned fingers and punctuated sparging. Speaking of sparging, I was just pouring hot water into my cooler at each interval when I needed to empty the hop bag of its grain bounty. Granted, there's nothing wrong with a little hobo brewing, but upgrading is exceptional. If you recall, my first brewing experience consisted of boiling extract on an outdoor barbeque in the biting WA atmosphere. Step by step, with the wisdom and benefactory of The Saint (and some B-day money here and there) I have been able to expand all-grain brewing down to the CA branch of c-beer (maybe that's what I should put on the label?). It seems I can't brew fast enough. This is partially due to the fact that I invite everyone who will come to every brew night and my taps pour freely. Later this week, I will christen my latest set-up, and provide you with all the details. In the meantime, pour one for me.